With the economy showing increased signs of weakness, it is welcome that that the Monetary Policy Committee (MPC) voted today to keep interest rates on hold. More surprising perhaps has been the recent positioning of MPC members that has fostered speculation that a rate rise was more likely. At one level this is understandable. With CPI inflation not far off a percentage point above the official target, some demonstration of vigilance was to be expected. Equally, increases in consumer credit are obviously setting off alarm bells, with various technical measures to address the situation recently announced alongside the publication of the Bank’s (June) Financial Stability Review (see ToUChstone discussion here). But these are very far from conditions of excess. The dominant concern is still of deficient not excessive aggregate demand – exemplified by the quite abrupt slowdown in GDP growth into 2017 and the dismal performance of business investment. UK Inflation is up not because the economy is booming, but because because of the post-referendum reduction in the exchange rate. Outside the UK, the main trend over recent months has been for inflation to weaken not strengthen. This comes in part as lower oil prices work through the system, but oil prices are still likely to be a symptom of a wider global deficiency of demand. 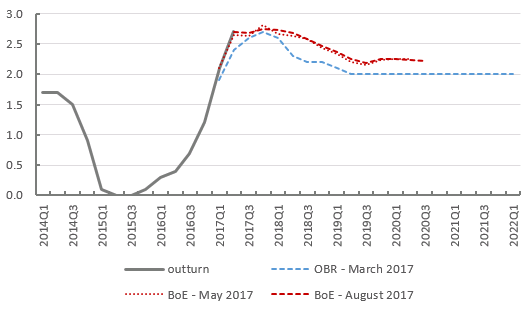 The Bank of England and OBR have expected UK inflation to come off relatively slowly, and the projections in today’s Inflation Report are imperceptibly changed from the position in May (chart below). My money is that this will happen faster than they expect. Similarly pressures on consumer credit (and low saving) are at in large part a function of the unprecedented decline in wages. This a low income rather than high consumption situation. A rate rise will not support deficient demand and will not increase income. Understandably there are concerns at the scale of the reliance on monetary policy to support the economy. Understandably there are concerns about the scale of reliance on consumer demand. But in the absence of action to support other sources of demand in the economy, attacking the consumer will simply make things worse. To be clear: increased government demand is not only imperative to strengthen and rebalance the economy, but also to permit one day the possibility of some normalisation in interest rates. Last year (immediately after the EU referendum) Mark Carney made it clear that monetary policy could only do so much – widely interpreted as a call for government to step in and play its part. Now is the time for him to make this point loud and clear. So one cheer that rates were not raised. But far better would be to be able to celebrate something constructive, rather than simply avoiding detriment.